The pages of the past are full of characters who remind us that history depends upon the great deeds of men and women, whether famous or humble. Where would America be without George Washington, or Daniel Boone, or Sojourner Truth, or Babe Ruth? Where would we be without so many characters who are less well remembered today? Taken together, however, the whole is much more than the sum of its parts. Every culture needs heroes who lead by example and uplift us all in the process. Too often lately, historians have been more intent on picking apart the reputations of previously revered Americans. At times it has seemed as if the academy were on the attack against much of its own culture, denying its past greatness while making heroes only of its dissidents and doubters. Yet as this collection vividly demonstrates, heroes come in many shapes and sizes, and we all gain when we remember and celebrate them. Forgotten Heroes includes nearly as many women as men, and nearly as many people from before 1900 as after. 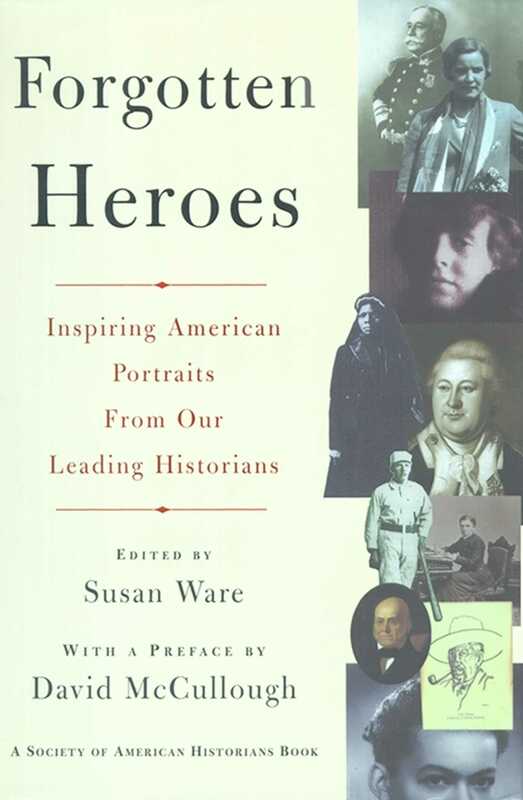 It expands the traditional definition of hero to encompass not only military figures and politicians who took risks for great causes, but also educators, religious leaders, reformers, labor leaders, publishers, athletes, and even a man who started a record company. Many of them were heroes of conscience -- men and women who insisted on doing the right thing, no matter how unpopular or risky, commanding respect even from those who disagreed. Some were famous in their day and have since been forgotten, or remembered only in caricature. Others were little-known even when alive -- yet they all deserve to be remembered today, especially at the gifted hands of the authors of this book. John Chapman, better known as Johnny Appleseed, never reached quite the legendary status that Daniel Boone or Davy Crockett enjoy, but who can help but be charmed by his practice of sowing apple seeds as he roamed the Ohio Valley, seeds that had grown into young saplings by the time settlers arrived? Largely absent today from textbooks and standard historical accounts, Johnny Appleseed lives on as a hero in American literature and folklore. It may seem odd to call John Chapman a forgotten hero, for almost everyone has heard of him, though most likely by his more familiar name: Johnny Appleseed, the vagabond planter of orchards in the Old Northwest. Few know more than that single fact about him, and much that has been written is altogether wrong. His appearance has been reported in Arkansas and Kansas, even as far west as Oregon, thousands of miles beyond the range of his travels. A book published in 1894 asserted not only that he was present at the Civil War battle of Lookout Mountain, nearly two decades after his death, but also that he was quite likely still alive. So intertwined is his life with legend that he has long seemed, as one historian wrote,"no man born of sperm but of myth." He has come to appear, as his most astute biographer, Robert Price, has stated, more "like a phantom sprung from the moon or from an ancient sycamore along the Muskingum or the Kokosing than someone begotten of the flesh." What we truly know about John Chapman's beginnings is shrouded in the meadow mists of the first mornings of the American republic. We can say with confidence that he was born in apple harvest time on September 26, 1774, in Leominster, Massachusetts, son of a minuteman who would be sent to Concord the following spring and of a Yankee woman whose first cousin was the fabled Count Rumford, who would be knighted by George III, head the regency in Bavaria, and gain international fame as a scientist. But after John's birth was registered in the local Congregational church, all traces of him disappear. During the next twenty-three years, this apparently well-educated New Englander left nary a mark. Rare in the pantheon of American heroes, he enters our line of sight full grown. He ran with the rabbit and slept with the stream...In the days of President Washington. In 1806, an early settler spotted him floating past Steubenville on the Ohio River in a strange craft: two canoes lashed together and bearing a cargo of rotting apples from which he procured seeds. He drifted with the current down the Ohio to Marietta, then made his way up the Muskingum to the mouth of White Woman Creek, and still farther up the Mohican into the Black Fork, only forty miles from Lake Erie, planting apple seeds at intervals on his voyage. When he came to a woodland glade along a stream, he would loosen the earth, sow his seeds, and weave a brush barricade to keep out the deer. Not the first to bring orchards to the West, or even the first to gain a livelihood from this activity, he was the first to spend a lifetime planting apple seeds in advance of the moving frontier, and he had an uncanny sense of where the routes of migration would be. For the next forty years, John Chapman carried out his self-appointed task. By 1810, he had made Ashland County, where he lived at times with his half-sister in a cabin near Mansfield, his main base, but he was never in one place for long. He traversed the watercourses of Ohio, planting new orchards and nurturing old ones. "He sleeps with his head toward the setting sun," a passage in Howard Fast's The Tall Hunter (1942) says. "Westward he goes, and always westward. He walks before the settlers, so that the fruit of the tree will greet them." When the pioneers arrived, they found Johnny's seedlings, now grown into saplings, ready for them to transplant. They treasured the apples, for they provided fruit for the table (even in winter, since they stored well), apple butter preserves, cider (both as a beverage and for vinegar), and brandy. He sowed medicinal herbs too: catnip, mullein, wintergreen, hoarhound, pennyroyal, and, it is said, perhaps unfairly, the foul-smelling dog fennel, a prolific bane, in the mistaken notion that it was a cure for malaria. Everyone who encountered him remarked on his appearance. Of medium height, spare but sinewy, with a weatherbeaten face and black (later gray) hair down to his shoulders, blue-eyed Johnny wore garb that even rough-hewn frontiersmen found peculiar. In latter-day pageants, he has been depicted clad only in an old coffee sack rent with holes for his arms and his head, with a mushpan as his headgear, giving an impression of a cross between the Scarecrow and the Tin Man in The Wizard of Oz. In 1939, an Ohio writer observed: "Most of us know better than any schoolchild the story of the gaunt, bearded, long-haired man who wandered alone through the Middle West during its settlement, carrying a Bible, a staff, and a sack, dressed in burlap, with a rope round his waist and his cook-pan for a hat." In truth, there is no evidence he ever topped his head with a mushpan (though that is likely always to be an ineradicable part of Johnny Appleseed lore), but the rest of the characterization is accurate enough. He wore ragged garments, including a long, collarless coat that fell to his knees, and when not barefoot, as he often was, battered shoes with no stockings. Fast's novel got it about right: "His garb was a tunic of the roughest homespun, gathered with a rope at the waist and falling to the knees. From the tunic, his bare arms and legs protruded, and he wore neither shoes nor moccasins....His hair was long and he wore a full beard. His skin was burned...dark...and his eyes were...blue." Know all men by these presents, that, I, John Chapman (by occupation a gatherer and planter of apple seeds), residing in Richland County, for the sum of thirty dollars, honest money, do hereby grant to said Jesse B. Thomas, late Senator from Illinois, his heirs and assigns forever, lot No. 145 in the corporation limits of the village of Mt. Vernon, State of Ohio. Yet he lived primitively and frequently sold his seedlings for a trifle (a "fip-penny bit") or bartered them for food or castoff clothes. Sometimes he took a promissory note he did not bother to collect or just gave away bits of his precious cargo. His main fare was corn mush, and he dwelled in lean-tos or hollow trees. One pioneer, recording a visit by Chapman to his cabin, remembered:"When bedtime arrived, Johnny was invited to turn in, a bed being prepared for his especial accommodation, but Johnny declined the proffered kindness, saying he chose to lay on the hearth by the fire, as he did not expect to sleep in a bed in the next world, so he would not in this." His religious views came from his study of the Swedish mystic Emanuel Swedenborg, who had spoken to spirits and angels and claimed to have had direct communication with God after the second coming of Christ, which he said had taken place in 1757. John Chapman was one of the very first American converts to Swedenborg's New Church, whose pitifully few members included a prominent Philadelphia publisher who had witnessed Benjamin Franklin's will, a judge who had clerked in the Edinburgh office of Sir Walter Scott's father, and a sculptor whose patron had been Frederick the Great. A zealous believer, he would tear Swedenborg's tracts into two or three parts and distribute them a segment at a time to the settlers, then exchange them for another portion on his next visit. After an arduous trek, he would fling himself down on the plank floor of a cabin, and, after asking his hosts whether they would like to hear "some news right fresh from heaven," recite to them from Swedenborg or the Bible. Years later, a woman recalled: "We can hear him read now, just as he did that summer day, when we were busy quilting upstairs, and he lay near the door, his voice rising denunciatory and thrilling -- strong and loud as the roar of wind and waves, then soft and soothing as the balmy airs that quivered the morning-glory leaves about his gray beard." His ascetic lifestyle lent conviction to the religious message he purveyed. In 1817, when Johnny was forty-two, a Philadelphian wrote to the Swedenborg headquarters in Manchester, England: "There is in the western country a very extraordinary missionary of the New Jerusalem. A man has appeared who seems to be almost independent of corporal wants and sufferings. He goes barefooted, can sleep anywhere, in house or out of house, and live upon the coarsest and most scanty fare. He has actually thawed the ice with his bare feet." When at a revival meeting a smug, pretentious evangelist (sometimes said to have been the hellfire preacher Peter Cartwright) posed the daunting rhetorical question, "Where is the man who, like the primitive Christian, walks toward heaven barefoot and clad in sackcloth?" there emerged from the throng the ragged figure of Johnny Appleseed replying, "Here is your primitive Christian." Did no hurt while he was there. Nonetheless, when Indians went on the warpath, he identified with the settlers. Toward the end of the 1820s, always ahead of the line of settlement, he moved into the cranberry bog country of the Shawnee in farthest northwestern Ohio, creating nurseries along the Maumee, the Auglaize, and the Saint Marys rivers. By 1830, he had crossed over into Indiana, where he was espied floating in a dugout with a cargo of apple seeds as he approached Wayne's fort. When the first settlers arrived at Fort Wayne and the hinterland of northeastern Indiana, there he was with his apple saplings awaiting them. Each year, Johnny, now in his fifties, would spend autumn and winter in central Ohio, where he would gather apple seeds for his next journey, then, in harmony with the rhythm of the seasons, head west through the Lake Erie marshes in the spring for Indiana. A perpetual nomad, he has been likened to the Wandering Jew, "a being driven by some supernatural necessity to roam through the world, homeless, undying, compelled to show himself in certain localities on certain occasions, and then to resume his endless pilgrimage." Early in 1845, he went once again to northern Indiana, this time to resurrect a failing orchard, and there, at a rude cabin on a snowy day in March, he succumbed to pneumonia. The Fort Wayne Sentinel reported: "Died in the neighborhood of this city, on Tuesday last, Mr. John Chapman, better known as Johnny Appleseed. The deceased was well known through this region by his eccentricity, and the strange garb he usually wore. He followed the occupation of nursery-man." Not many weeks later, a northern Indiana diarist recorded: "First apple blossoms." When word of his death reached the floor of the U.S. Senate, Sam Houston said, "Farewell, dear old eccentric heart. Your labor has been a labor of love, and generations yet unborn will rise up and call you blessed." His final resting place is on an Indiana hillside where, one early writer noted, "In the spring the wild thorn-apple waves its boughs of pink and white above his unmarked grave." In an eloquent elegy, Robert Price has concluded, "He had walked more miles than any other recorded borderer of his generation -- now he belonged to the American trails and rivers forever." At the rosy fruit that round them lies. "These trees were planted by Apple-Seed John." John Chapman left America a distinctive legacy. Unlike Daniel Boone or Wyatt Earp, he carried no gun, and unlike the mythical Paul Bunyan, he won renown not by felling trees but by planting them. As the country's foremost historian of folklore pointed out, "Where Bunyan represents destructive power, Johnny Appleseed connotes sweet fertility." He embodies, a midwestern writer, Charles Allen Smart, declared on the eve of World War II, "the America that has...nurtured life instead of destroying it, and that has been sensitive to the beauty of this continent, and done something to create here a civilization. Johnny Appleseed stands for ourselves at our best."